Condition: Reasonable. Slightly soiled troughout. Lower margin cut short. Scattered small ruststains. Several professional repairs on verso. Verso: blank. 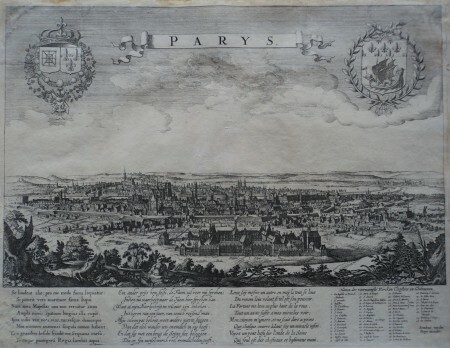 Very rare large profile view of Paris facing from the north. Below the image, an eight-piece Latin verse of A. Montanus, with a Dutch and a French translation. Legend with 58 keys and publishers imprint lower right. Nice and dark impression.